If your power windows are not working properly on your Toyota Prado, try this trick. You may also need to do this after replacing your car battery. A while ago I had to change the battery in my 2005 model 120-series Toyota Prado. As most owners would know, removing the battery and installing a new one requires re-programming the PIN into the car stereo. I have the PIN and followed the instructions in the owners’ manual to reprogram the radio PIN. Easy. Around the same time, my power windows started to play up. It seemed that I could operate all four power windows with the switch on the respective door, but I could not operate the passengers windows from the master power window switch on the driver’s door. I had read that there were certain Toyota vehicles that were subject to a recall on the driver’s door power window switch. I assumed that was the problem. I went to the local Toyota dealer to get the driver’s door window switch checked out. In the conversation with the service guy, he casually asked whether I had recently replaced the battery. “Yes, I had,” I replied. “Ahh, that will be your problem. You need to reprogram your power windows,” he said. “Does it explain how to do this in the owner’s manual?” I asked. And so I went home to reprogram the power windows on my Toyota Prado. The instructions on how to re-program the power windows on the Toyota Prado 120-series are somewhat buried in the car owner’s manual. The procedure is called normalising the power windows and can be found on page 23 of my manual under the “Jam protection function” subheading. The section makes absolutely no reference to needing to do this after replacing the Prado’s battery. The Toyota service guy seemed to indicate that it needed to be done every time you replace the car’s battery. Push down the power window switch on each door and lower the window halfway. Pull up the switch until the window closes and hold the switch for a second. That is it! There is no three. 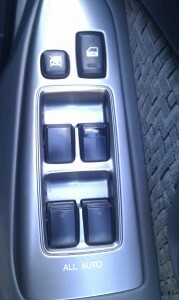 I did this to the three passenger windows using the switches on their respective doors. The master switch on the driver’s door now operates again. We own a Toyota Wish (Japan) and just replaced a bad battery a couple of days ago. I was contemplating going down the rabbit hole of fuses and relay testing to figure out why the driver couldn’t control the other windows. I’m glad I did a web search first. Your post was a time and $ saver. Thanks for the help and if I could, I would flag this post for anyone else owning a Toyota model like ours. Thanks again. Fantastic… Thank you very much for this post, saved me a lot of headace and money! Works like new again, after disconnecting that battery.. Thanks, that should be printed in bold on the first page of the manual..
Thankyou very much for help. Have a son that wouldn’t believe his Diesel Fitter dad could fix the problem with his power window control on his Prado GXL 120 series .. he said “I will take it and get it fixed properly”… famous last words had to drag him off the lounge as he was watching TV. Showed him this solution and it worked. He is relucent to admit I proved him wrong lol. He now owes me a 4pack of Jacks and Cola. Just goggled “power window problems Prado” came across your post, 3 minutes later windows are working from drivers control. Yes!!! Many thanks, I thought it might have been a fuse but there is only one fuse for the driver’s window control. Saved me a trip to the auto electrician. Thanks for the advice. Saved us a big headache! And thanks from me too. I had found normalisation in the manual and tried it, but the manual is poorly written and when it says to make sure the windows open automatically, I read that as meaning they would re-open once you had closed them and held the button up for a second, which they don’t. Have just gone through it on each of the doors and all work fine. Thought I was headed for an auto elctrician as mine stopped after a jump start by the NRMA, not a battery replacement and one of the several power window fuses was actually blown, but replacing it didn’t fix them. Hey mate, works a treat! Thanks for saving me the cost and embarrassment of having to try to explain that to the dealer! This was so simple thanks a million. This worked on my 2003 lc4. No other result on google helped. buddy, thank you so much for your instructions. it helped me a lot today to programme my car. I had the same problem today on my prado, I followed the procedure that you outlines and Lo and behold … it worked like magic. Thanks mate… you have made me look like I know how to finally fix the car! The wife had RACQ out after I’d gone to work post changing the battery to replace a headlight bulb…. yeah I know it’s simple but I had to do it with one hand! Cheers and thanks again for the no nonsense advice. HI, about to try the window reset, I hope it works I also have a problem with the base idle really low] since battery change any ideas? My Cressida would re learn after a few starts the Prado wont. Got me stumped. thanks pal replaced my battery 2 weeks ago & the lights in the switch started flashing just reset the windows & all good, the wonders of the internet. ok trying to find the rotten fuse was a drama with 4 fuse boxes 3 easy to find 4th not so easy it is on the passenger side. Wow, Thanks ! Exactly my problem with a 2005 120 series Prado. Your instructions are clearer than the manual. Fixed the problem in less than a minute … I agonised over this for months after checking every fuse in the car. What a relief. You are a technical god. Thank you sir! You saved our day! You are a legend! Thank you for instructions. Great work. Pity about the user manuals are written that well. I had alternator issues on a 2005 Mark X and after having it replaced I couldn’t control the windows from the central unit, My mechanic he said we might need to hook up the car to a computer so he can diognise the problem but I quickly Googled my problem and found this solution, thank you very much you saved me a some bucks. Thanks for the simple solution to this wierd problem. Ledge..
Changed battery:- no windows, thought, will try google but probably will be a waste of time, found your post, went outside and tried it, MATE, YOU REALLY ARE A LEGEND !!!! I have read other posts on different problems and so many are just ridiculous . Thank you so much. Thanks heaps. Yes I also had my battery replaced recently. Hey Rex your a marvel!!!! I just spent 2 days working on my 2003 Prado. Took f/r door trim off to chase up a rattle. Then replace my head unit with a aftermarket one. All went well, fixed the rattle and the head unit installation with reverse camera. 2 days later dead battery?? Replaced by road side assistance guy who had no idea why the windows would be affected. Read this post ,too me more time to walk out to the car than it took to fix it. Cheers again. Disconnected the battery to fit a light bar and had this problem. Fixed after reading this. Maay thanks! I just realized today that I couldn’t open my rear windows and my drivers one wouldn’t auto close since husband disconnected battery, so thought do a google and found this. Thanks for the information all back to full working order again. Just replaced the battery on my Mark x 2006, and encounter the same problem. Followed your instructions and it worked marvelously. I can now operate all four power windows with the switch on the driver’s door. Second battery change out remembered there was a trick to resetting windows couldn’t remember it, revisit to website for reminder. You are a life saver for me. I am an expat in the Middle East, and I was afraid I had to spend the whole day at the Toyota dealership (who is a Rip-Off unfortunately) and making them understand your problem in Arabic is impossible. Than you so much and God Bless You. Thank you. The fix worked beautifully. I was fearing an autoelectician bill! Fantastic! Also works with a Toyota Wish, as I just had the same problem (after flattening the battery leaving an internal light on). Thanks for posting it, saved me a lot of hassle right when I don’t need it! I’ve Just fitted a reverse camera and now my A/C doesn’t work the fuel distance head unit doesn’t work and the windows don’t work? Thanks so much ! Just saved me a lot of heartache! I disconnected the battery last weekend and had the same problem with the electric windows, but now they are back in action after following your reset instructions. Again you saved another Prado owner – thank you so much for your blog – greatly appreciated! You saved me soooo much trouble. As the masses above, Thank you very much for your info. Like others thought I was up for anew master switch. Great Work. I feel lucky today because of you !! Good advice. Went to do this today but already fixed as I actually did this accedentially on a que on the M6 last night. Only drivers window was a problem. And yet another thank-you from me. ? Thought I’d fried something disconnecting the battery!!! I never thought it would be that simple! One happy little vegemite ? Thanks a million. Just saved us money and worry. Good old google. I have issues with mine .master and no door switches work..a.c,,speedo,,blinkers all fine..pulled apart master switch cleaned all contacts, tested , have ,12v – going out of master to all doors..any tips what to look for..? Dear , Thank you for sharing life hacking info this with us. My ride is a 2002 Caldina GT four,had the same problem and I overcome with this solution.really appreciate it.Thanks . U r the best.. thank you so much… my mechanic told me to buy a new switch.. I think I will share your post with him.. Thanks from me also. I had to remove the door skin to replace a faulty central locking actuator and once reassembled I thought I had shorted something out in the process. Window would only operate from door itself. I thought I was up for a new switch for $150. This worked a treat, thanks so much. Fixed the issue with my 2006 prado – you rock! I had same problem with my Windows after I changed the battery. You idea worked perfectly well. My battery died as it was not used for a while. The windows don’t work any which way, the passenger is stuck open by about 1/2 inch. Neither switches work, and I don’t know what fuse to check, we tested them all with a current tester and they’re all ok. Any suggestions please? Well it doesn’t work for me. I tried lowering each window halfway then up again for a sec. The drivers window still keeps opening itself halfway.